A bunch of black boxes, stacked on top of each other. If I didn't know that those are camera views if I click on them, I'd have thought it was broken. 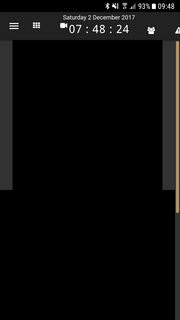 Theres no outline, no text, just black rectangles, no jpg preview. Additionally, the mobile interface itself just seems like a slightly squished version of the desktop view with no attempt to be mobile friendly.